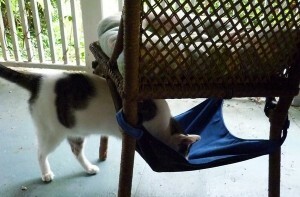 Summer is coming and we have a fresh new giveaway of a Kitty Cradle hammock. How fresh and fab? These portable cuddle spots won’t be available to buy until this summer, but one lucky Cat Wisdom 101 reader will win one next week! 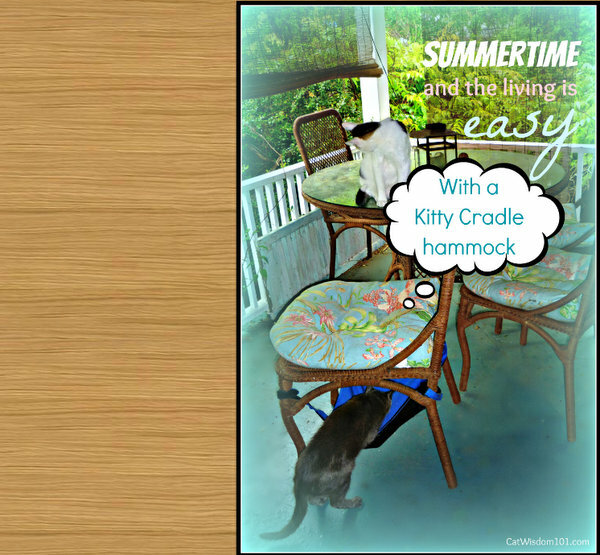 Kitty Cradles are adjustable, machine washable hammocks with Velcro straps which convert just about any chair or side table into a cozy kitty nook. We tried the hammock on two, very different chairs both indoors and on the porch. We like how easy it is to gain space while doubling napping spots. Win win! The strong construction will hold cats up to 20+ lbs. safely. You can use either side. One side is blue and the other is a fleecy black. There’s no limit to where you can use them, so have fun and get creative. If you want to be the first on your block to nab one, check out the Kitty Cradle Facebook page for updates, giveaways and other goodies. This is Vladimir, the spokescat for Kitty Cradle loafing on the job. If you want a great chance at winning one, simply leave a comment at this post anytime before 11:59 pm ET May 7, 2012. The winner will be announced next Wednesday. Good luck! Now back to our regularly scheduled catnap. I’ve got 7 kitties — I’m sure they will all want some time in the hammock! Seems really neat! I think my cats would like it! SQUEEEEE my gorgeous Freyja would look wonderful under my chair with all her fluff hanging out!!! My cat would love this! What an ingenius idea!!! LOVE IT!!!! Hope to win. My two spoiled rescues would love this but they donate whatever they get (all but their lil fuzzy mice! MINE! 😉 to our local cat shelter. 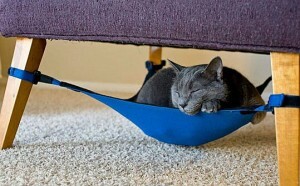 I bet the shelter would love this hammock! Oh I bet my three rescues would love this. That is the neatest thing. My cats would love that. I think my kitty Boots would love this! He likes to be near me when I am at the desk on the computer. I could put this right under my desk chair! Please include us in your drawing. We think our kitties would love this! Could you include us in the drawing? Thanks! Oh man. I would try to put this by a window so they could have the best of both worlds, a view and a nap. Useful information like this one must be kept and maintained so I will put this one on my twitter list! Thanks for this wonderful post and hoping to post more of this! My kitties would LOVE to swing in this! Hello everyone! We’re so happy everyone likes the Kitty Cradle and we wish that we could giveaway one to everyone! There will be more giveaways to come in the future. To make sure you’re aware of them, please LIKE our Facebook page (www.facebook.com/kittycradle) so we can keep you informed. Also, make sure to register your e-mail at our homepage (www.kittycradle.com) so you can be first in line to take one home when they go on sale. Thanks Layla for the awesome review! That would be great at our shelter! OMG, We are full time staff to 4 kitties, plus foster for a local rescue (Rebecca’s Rescues on FaceBook), so we are always trying to make room for us humans to sit on the couch or kitchen chairs. This would be great! What a great idea! I’d LOVE to win one of these for my four legged kids! My 3 babies would love to sleep in this hammock. They share everything so they would each sleep in it. My oldest one is small and she would fit nice but my other 2 are chunky and it will be fun watching them squeeze into this hammock. My cat Daisy would love this! We live in a small apartment so any new space for her would be fantastic. She gets pretty bored in here! This looks like such a neat product, I’m sure my kitties would love it. We (6 cats) would LOVE to try one out! Oh please oh please mom can we please have one? This Battle of the Beds is getting old! It was old before it began! You were the one who had the bright idea to bring into this house the Nuisance Dressed In White — now you should be the one to win this thing for me! I’m tired of Adaptability! It’s time to Take A Stand! Sorry Bugs. You know we never win anything. Go back to Short Bed. Fang’s in Top Shelf and you know what that means. Love your pics etc, can’t help myself I always read! Sorry I missed you when you were in Florida, but maybe next time we can connect. If I don’t win I might try my hand at sewing one! Aw! My cat Pooka who just passed away would have loved one of these, but I think her 3 siblings who are left would also enjoy it. Its a ingenious idea, and I will be buying one for me and one for my parent’s kitties when they come out even if I don’t win one! We think that would be fabulous! What a neat idea! I think Gracie would love this! I would love to win this for my 5 kitties. We live in a townhouse so space is limited. It’s a great way to utilize “wasted” space! Now, now, kitties….we don’t know if we’ve won…so simmer down! And if we do win, we have to be patient and take our turn….15 minutes each puddy, and mommy gets to put her feet up on it for 1/2 hour. Yes, we’d love to win…..super idea…. I’d love to have one of these for my fatso Jonquil, but he might just be too heavy for it. However, Emily would like it — she likes to hide. Also, D-2 says he’d like his outside, please! My kitties would love this! My seven kitties would love this! This is a great idea, especially since most of my cats lounge under furniture anyway. I would love to win this for our kitty, Montana! I can just picture him lounging while watching the birds outside from our back door! Love to have one of these for the boys! Nefertiti: That looks purrrrrrrrrrfect! Can we have one? Nefertiti: Careful, you… Or I’ll set the dog on you. Snoetje: Awwwwwwwww… not fair! Ok, ok, I’ll share. *angel grin* So will you share your kitty-cradle-hammock with us? Pleeeeeeeeeeaaaaaase? So sweet…Looks very relaxing for Vladimir & I’m sure Nikita would love this as well. Thanks for the giveaway. That would sure make Easy Like Sunday darn easy! This is awesome!! Especially for those without alot of room and for someone like me with an extra FLOOFY girl LOL!! Great Prize!!! well, my cats would be fighting over it but we definitely need this!!!! I won’t let my cat see this! My kitties would love to try this out. Me, too! Our kitties would love this! The beautiful Miss would like one of these. She might even share I with her 3kitty brothers. maybe. My sweet Tucker would like this. This looks like it could be more fun than the stealth hammock we’ve set up in the box spring in the bedroom. My fur-babies would love this! I currently have 4 of 5 cats occupying my office, so this would be another perfect way to get one of them off my desk so I can actually get some work done, for a change!!! I think i need three of them..
Oh boy…my Li’l Lucy is lusting for one of those! Holy cat treats! My kitties would love this! I’m working to enrich their environment even more and this would be perfect! The cats at My Mathews House Cat Shelter would love this. This is awesome! Think I would fit in it? This is absolutely brilliant! Our cats would love a Kitty Cradle! My foster kitties would have such fun with this. I could just see all 5 of my little 4 week old babies curled up in it sound asleep!! Mr. Ed would love yet another place to nap! Thank you meowy much! My kitty Baker already lounges underneath my kitchen table. Why not lounge in style and comfort? I’d love to win this for him! How awesome is that! I have 3 little friends that would love one. My Big Budda would love it if he got one. However, he would get to share it with Darla and Izzy. He may never have the opportunity to have a nap in it with those 2 around. 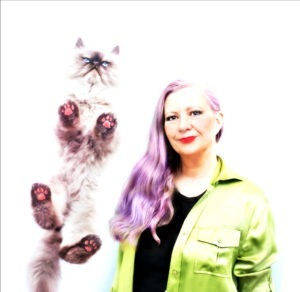 My two fluffy lovable Ragdolls would love love love these…..the space saving is ingenious! Live in a condo so this is really important! Thanks designers! my kittys would definately love this! Oh gosh! My cat Monty will go CRRRAZZY for this! 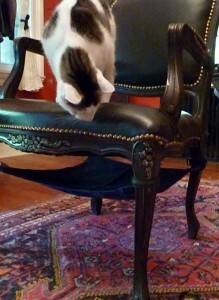 It’s another excuse for him to get under our chairs, including my mom’s rocking chair! Thanks for this! My kitty loves her window hammock so I know she would love this too! We think our kitties would love this fur sure! This would be a HUGE hit at my house! Maybe I could even sit at my desk w/o a cat trying to get on my lap, the keyboard, etc…. nah, that would never happen, LOL! That hammick looks FUN!!! Do you think I can swing in it?? ?